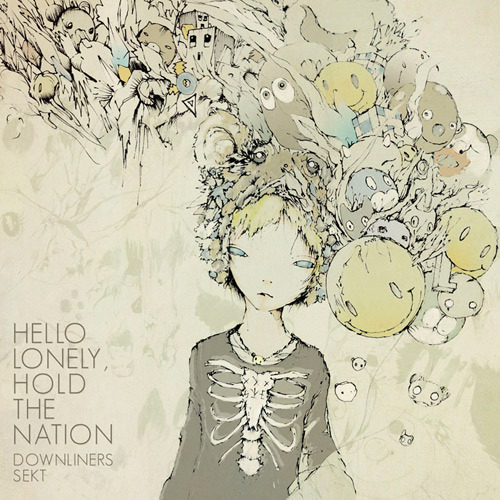 ‘Hello Lonely, Hold the nation’ is the long awaited new release by enigmatic bass-tronauts, Downliners Sekt. Leaving aside the post rock, industrial leanings of their critically acclaimed predecessor, ‘The Saltire Wave’, the group lays out a subsonic adventure through haunting melodies and phantasmic soul. Teaming with Barcelona´s bass music pioneers, Disboot, this release offers one of the most progressive discs of electronic music emanating from Western Europe. Already pushing the limits of dubstep, grime and contemporary bass music before they were officially ‘baptized’, Downliners Sekt pick up the race where they left off with their ‘Statement of Purpose’ LP. ‘Hello Lonely, Hold the Nation’ combines fine sonic manipulation with the ingenious song craft they have honed throughout a varied musical history. Crushing your white Ipod headphones into the dust, this work of high end hiss, shuffling textural rhythms and rumbling bass threatens to destroy even the heaviest sound systems. This new beast is their own niche of bass music, a style of working they like to call ‘slower, but faster’. This, their fifth release, marks the return of Downliners Sekt to 12″ vinyl format, 6 years after their first EP (for b: cuts), The Pledge, which was later released for the F Communications ‘Megasoft Office’ compilation. As the 11th release for Disboot, ‘Hello Lonely, Hold The Nation’ is an exciting new chapter in their potent catalogue, built as it is on the strong foundations of releases from artists as diverse as Cauto, Filastine and Offshore.